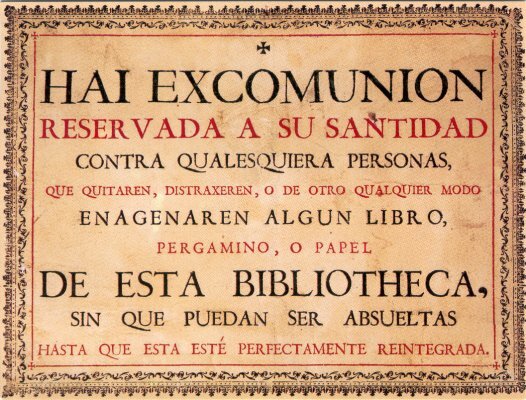 Threat of excommunication to thieves of books in the library of the university of Salamanca. Here, Jesus’ actions in breathing on his disciples mirror the ending of Genesis 1:1, ‘…the Spirit of God (Hebrew: great wind, breath) was hovering over the waters.’ Jesus’ death and resurrection has brought about the New Creation, in which the Spirit comes in power as He did in the beginning, this time to never be taken away from those who are pert of the new humanity in Christ. And, just as the Spirit was at work in the dark, formless void to bring forth a creation with order and goodness as the Father spoke the word of command, and the Son – the Word – joyfully obeyed so that ‘all things were created through Him and for Him’ (Colossians 1:16), so now the Spirit is at work to bring order out of the chaos of darkness and death that sin and sinners have brought about in this world. This action of bringing order from chaos is the action of forgiveness. This passage is also John’s ‘Great Commission.’ Jesus sends his disciples into the world, just as the Father sent Him, and in the same way that Jesus could declare to people, ‘Your sins are forgiven.’ (Luke 5:20, 7:48) our commission is to likewise declare the forgiveness of sins through the proclamation of the Gospel. Yet it is more than just declaration; it is the practice of forgiveness. Jesus makes it clear that their action will actually produce the result of forgiveness in people’s lives: ‘…if you forgive anyone his sins, they are forgiven; if you do not forgive them, they are not forgiven.’ (v. 23). It is important to see here that this is not the giving of spiritual power of one person over another, implying that someone could effectively determine another individual’s salvation. This commission is given corporately to the disciples, and through their apostolic authority, to the whole church. The mission of the church is to herald the Gospel among the nations, to those who have not yet heard, so that they too may call on the Lord and be saved. This is a solemn duty. Without the proclamation of the Gospel, people will not know the forgiveness that come by Christ; and so to withhold our proclamation is effectively to cut them off from God’s grace. The two verbs in this verse are effectively, ‘send forth’ and ‘hold back’, which convey the contrasting images of generosity and mean spiritedness. So, God’s forgiveness comes to people in the context of Gospel proclamation and application. As we saw in the last study, true Christian forgiveness must always be in the basis of Jesus’ atoning death. Our sins may be forgiven not because God no longer considers them to be serious enough for Him to judge, but because the God-Man Jesus has taken upon Himself the terrible judgement our sins deserve, and so they have been cancelled out. And so just as the Gospel is the basis for forgiveness, so also a Gospel that is proclaimed without the declaration and assurance of forgiveness through faith in Jesus is not a real Gospel. “If your brother or sister sins against you, go and point out their fault, just between the two of you. If they listen to you, you have won them over. But if they will not listen, take one or two others along, so that ‘every matter may be established by the testimony of two or three witnesses. ’ If they still refuse to listen, tell it to the church; and if they refuse to listen even to the church, treat them as you would a pagan or a tax collector. The matter of unforgiveness may start on a personal level, but it has implications for the community of the church. Two people who are in Christ are united to one another and to all the member of the church, and so a division between individuals really constitutes a division in the body. Sadly, personal disputes, especially among leaders, have been the catalyst for church splits and even dissolution; but this is a situation not of differences in theology, methodology or opinion, but of action that can be clearly identified as sin. The aim of speaking privately between the two is not about justice, but reconciliation. The NIV, maybe to avoid gender specific language, misses this personal dimension; the text literally says, ‘…you have gained your brother.’ It is not about winning the argument, or proving who was in the wrong, but winning the relationship. By seeking to deal with the matter privately, I avoid bearing false witness against my neighbour (The 9th commandment, Exodus 20:16) Forgiveness here is not merely settling or neutralising a matter and agreeing to not let it bother us again. It must result in a transformation of the relationship from hostility to love. This step does not necessarily mean that my case will be ‘proven in my favour’. The witnesses may show my brother or sister their sin more clearly, or their perspective may help me see things differently, and in that sense the ‘witnesses’ may also be ‘mediators’. As we saw above, unresolved division between individuals affects the church whether we like (or notice) it or not. This is not a name-and-shame exercise; in fact the language implies (‘tell it to,’ not ‘bring him before’) that the offender may not be present. It is an open explanation of a rift that has happened, and which may have caused ripples of unease among the community. It is also a confession of my own weakness; because I have been unable to effect reconciliation with my brother or sister, I now need the help of the community – my family – to work out that reconciliation on my behalf. The final step is not ostracisation, but assuming that the offender does not really understand the Gospel because of the absence of the fruit of repentance. We need to remember that the one recording the words, ‘…let him be to you as a Gentile and a tax collector,’ was himself a tax collector until he was confronted with and called by Jesus. It would be a bizarre thing if Matthew were to include in his Gospel an instruction that meant that he himself had no right to be a disciple, let alone an Apostle and writer of Scripture! Jesus himself showed by example what the right approach is for a child of God towards ‘these people’ – love, mercy and compassion, mixed with a firmness about sin, and the call to repent and believe. Excommunication is always with the aim of reconciliation; it does not even mean exclusion from meetings. Again this emphasises relationships over personal justice. Are we willing – even happy – once the church community is acting in loving discipline towards our brother or sister, to just leave it, even if it involves great personal loss? When we are commanded, ‘…if one has a complaint against another, [forgive] each other; as the Lord has forgiven you, so you also must forgive.’ (Colossians 3:13) are we willing to forgive in the same way that we have been forgiven? God, in forgiving us, bore in himself at the cross, the great cost that our sin incurred. Similarly, if we are to reflect the grace of Jesus, forgiveness and reconciliation with our brothers and sister may well be a great personal cost; yet what we gain in return is far greater by comparison. very good James. Thanks. These quality insights out-teach a lot of unclear teaching regarding forgiveness and reconciliation, especially a lot of the nonsense that takes place within a congregation.